From the deserts of Las Vegas, we have returned, and boy do we have some stories to tell! Not your average Vegas take-aways but rather stories of pride and joy! Which I am quite sure is a rare occurrence for the general population when leaving Las Vegas! Now I will be the first to tell you that I have been loyal to Harley since birth. 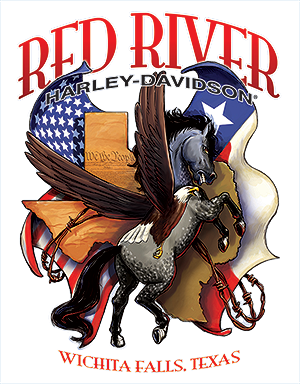 Although, truth be told, I was bred into Harley, we opened Red River Harley in 1985 when I was two years old, so I must admit I did not become a loyal H-D® customer through a tested and tried effort. So, to say that I had a bit of a bias toward other brands was not an exaggeration. Although, after completing the Harley-Davidson® Back to the Track course at the Las Vegas Motor Speedway where Sean & I rode a collection of Harley models and the direct competitor’s models, I can now stand here with unwavering confidence as I say to you with absolute pride and joy spread across my boastful face that I have NEVER felt more secure in my brand loyalty than I do today. I will admit, I was surprised by the “other guys” brands as they were quite comparable to ours. They look very similar (which is a bit of a turn off to me personally, I mean talk about biting our style) but our look is a great look, so I can’t blame them for trying to emulate greatness. After giving each model a good once over, comparing seat heights, tires, motors, ease of the kickstand, ease of the controls in general, and over all aesthetics I settled into the saddle to test out the competitors for the first time in my life. I will tell you I gave them a fair chance, I did not come in jaded or unable to separate my bias from the task at hand. I welcomed the challenge. Impress me. Let’s see what you got, because I know what Harley is all about and I was excited to find out first-hand what the competitors have to offer. Lean back, take it in, and let’s get down to business. After going over the straight forward pros and cons of the bike mentioned above it was time to take it further. What emotions does this bike evoke? Let the sound, the look, the feel, wash over me all before twisting the throttle for the first time. Does it not only appeal to me physically (fit & function) but also mentally; Does it speak to my soul? Does it meet all of those philosophical points my soul thrives on as my Harley does? Yes, I ask a lot of my motorcycle because I know what it can provide. Sanity. Plain and simple. So yes, I held the “other” bikes to the same standard, and I will admit I was pleasantly surprised by a few models. I will also stand here proudly boasting that although pleasantly surprised…never once did any brand impress me enough to make me question my loyalty to Harley-Davidson®. To all of those who have test drove the competitors, good for you! I implore you to do so! Then come to us directly after and test drive ours. To all of those who were “die hard Dyna” and hate that Harley phased out your babies…come test ride the new set-up…then let’s talk. Until you ride it, you will not understand. Not only did we ride the new frames with the direct competitors, we rode the last year H-D® model as well back to back with the new Softails. Night and day! Absolutely! I have NEVER been more impressed with a product than I am with the new Softail. Light-weight, responsive, and so much power! I was feeling like Tim “The Tool Man” Taylor as I rounded the track with a Tool Time grunt “Arghh! Arr! Arrrr!” heard inside my helmet with every turn. Power, power, and MORE POWER! 103, 107, and 114 cubic inches nestled in a lighter than ever before frame – GET OUT OF TOWN! The new frame and set-up is riding perfection! Comfort, Fit, Style, Function, and KICKASS POWER all rolled up into one. If you love to ride you will undoubtedly love to ride these new bikes. Out of all the models that we rode, I will give a tip of my cap to Indian and Triumph, admittedly they both had some quality products to test. And test them we did! We dogged those puppies around the track, pushed them to their limits, and gave them a fair assessment. They held their own BUT after parking and hopping on a Harley again, instantly that feeling of “damn, this is IT” washed over and I have never felt more relieved to be back on a Harley! Indian has style and comfort, but when it comes to shear POWER and overall function they fall short in comparison. It’s like they made a product that hits a mark, but hitting THE mark? Not exactly, they just missed it with that “went the extra mile” relief you get with Harley-Davidson® quality and finish absent. When it came to product function and over-all quality I felt a clear distinction between Harley and Indian/Triumph looming over me as I switched from riding the competitor back to riding Harley. For example, the braking system on the Indians were terrible. They felt almost absent as you are giving it all you’ve got to stop, and you are still barreling forward. Not a comforting feeling to say the least. As with Indian, Triumph® has a very nice product. From looks to performance, I was impressed. Although, I am happy to report in an “apples to apples” comparison Harley came out on top. I love the look of the Triumph Bonneville Bobber but when it’s 1200 cc’s is stacked next to it’s H-D® competitor the ’18 Street Bob with it’s 107 cubic inch engine pushing out 1746 cc’s it was blown out of the water, plain and simple. We rode other competitors but they either did not impress me at all or depressed me as I rode them around the track and I do not feel they even deserve an argument in the H-D® vs. category. Looking back over my notes that were taken after each bike ridden some of the reoccurring words and phrases to describe the competitors were as follows: “sluggish” “unresponsive” “poor braking” “missing low end torque” “heavy” ”touchy” “bulky”. Whereas some of the reoccurring words and phrases with Harley models: “smooth” “responsive” “POWER” “balanced”. What an enlightening experience that has now given me the ability to give a fair assessment across the boards, from Kawasaki to Motto Guzzi all the way back to Harley. I have physically ridden them for myself and can speak knowledgably to what they have to offer…and not offer for that matter. Here is a list of all of the bikes that we rode in the two days that we completed the course: ’17 Heritage Classic, ’18 Heritage Classic 114, Indian Springfield, ’17 Fat Bob, ‘ 18 Fat Bob, Moto Guzzi Eldorado, ’17 Softail Slim, ’18 Softail Slim, Indian Chief Classic, ’17 Fat Boy S, ’18 Fat Boy 114, Kawasaki Vulcan 1700 Vaquero, ’17 Deluxe, ’18 Deluxe, Indian Chief Classic, ’17 Breakout, ’18 Breakout, Suzuki C90T, ’17 Fat Bob, ’18 Fat Bob 114, Yamaha Star Raider 113, ’17 Street Bob, ’18 Street Bob, Triumph Bobber, Indian Chief Vintage, ’18 Sport Glide, ’18 Breakout 114, Kawasaki Vulcan 1700 Voyager, ’17 Low Rider, ’18 Low Rider, Triumph Thunderbird, ’17 Fat Boy, ’18 Fat Boy, Suzuki Boulevard Intruder M109R. 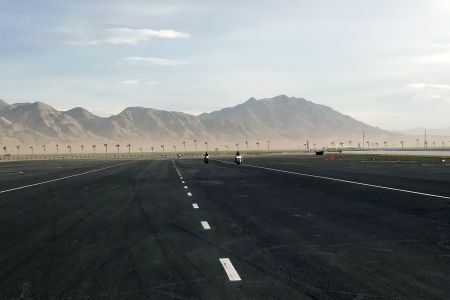 Not only did we test ride these bikes on two of the Las Vegas Motor Speedway tracks, but our instructors were a group made up of only professional motorcycle racers from different circuits and backgrounds. How cool was that!? Extremely! To have responses and critiques from riders who ride professionally for a living was a life changing experience. Even better they rode with us, either trailing behind then pulling up at the stops and giving us tips and pointers or gunning it out in front of us so that we could mirror how they ride the track. Talk about educational and FUN! Straight up, pure adrenaline, push yourself and your equipment to the limits – FUN! I have to say that this experience was one of my favorite experiences in my life time. Digging, grinding, and carving through those corners was the definition of fun and on top of that, having the professional critiques added to the mix, it seriously does not get any better! If you have any questions about any of these bikes or how we stacked up, please don’t hesitate to ask me or Sean about our experience. We would love to talk about our big adventure with you and tell you all of the reasons why we believe Harley-Davidson® is THE BEST! Speaking of THE BEST, I would like to add just a few things that really resonated with me during the classroom portion of the course. Harley-Davidson® has the best quality paint not only for motorcycles but across the boards (cars, boats, motorcycles, etc) H-D® has such high standards, they regulate the hygiene products, food consumption, clothing material, and any other factors that could come out of the human body for the employees who work in the H-D® paint department. Before work every day they have to pass an inspection to get into the building. For example, an employee went to the movies with his wife after work and shared a big box of buttered popcorn. He washed his hands multiple times before work the next morning but upon inspection he failed. They sent him to wash them again before attempting the inspection again. He scrubbed them multiple times then re-attempted inspection…under the microscope he still had trace amounts of butter substance on his hands and they sent him home for two days to get it taken care of. Talk about quality control! HARLEY-DAVIDSON® IS THE LONGEST RUNNING BRAND IN AMERICA TODAY.